Animals, the Great Outdoors and Exercise, it's a Winning combination! As many of you know, Sophie and I love to be outside in the woods where we hike and run together. But many of you may not know that as a member of the ASPCA ( American Society for the Prevention of Cruelty to Animals ), I donate and support this wonderful cause. 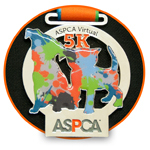 This June, I will be participating in the inaugural ASPCA Virtual 5K run. When I learned of this opportunity, I thought what a " Win Win " situation. I am honored to be raising awareness and the much needed funding to support the ASPCA life-saving programs and services to millions of animals nationwide. At the same time, what a great way to have fun by running in the Midnight Sun race in Reykjavik, Iceland this June 23rd. I will be running for every abused and homeless animal that deserves a second chance at life. ( Sophie is registered with me, and supports the cause also, even though she will not be in attendance at the race.) Larry is expected to join in and run also, most likely leaving me in the dust as he crosses the finish line!! The ASPCA is very important to me and I appreciate any help you can give. Please support me by making a donation and help me make a positive impact in the lives of animals! Thank you!